Marnie Ballane heads the Speakers’ Spotlight Calgary office as Senior Vice President of the Western Region. She loves to get out and see speakers in action and is passionate about the meetings industry in Alberta and beyond. When she’s not working, you can find Marnie with her three sons or following all things football. She even aspires to be tennis champion of Alberta (seniors division) one day! Marnie holds an arts degree from the University of Calgary. Lush, gorgeous and completely engaging, Made in Italy takes up where Dolce Vita left off, giving us a full-on appreciation of all things Italian. Gorgeous location photography puts the reader right into the scene, offering atmosphere to die for. Over two hundred extraordinary recipes, offering simple, delicious fare from all over Italy, make this cookbook utterly desirable for any food lover and cook. For the armchair traveller and pleasure-seeking gourmand, Made in Italy is a trip worth taking. 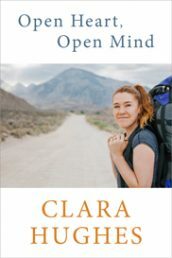 Told with honesty and passion, Open Heart, Open Mind is Clara’s personal journey through physical and mental pain to a life where love and understanding can thrive. This revelatory and inspiring story will touch the hearts of readers everywhere.